Andries Pretorius whose larger than life presence played a major part in the history of interior South Africa. One of the growing pains of the Zuid-Afrikaansche Republiek which affected this part of the Magaliesberg was the bad blood between the adherents of the various Voortrekker leaders. Andries Hendrik Potgieter, the founder of Potchefstroom, was not very popular with the followers of Andries Pretorius who regarded him as a coward for abandoning Piet Uys in the battle of Italeni. Andries Pretorius was the hero of Blood River and his commando was known as the ‘Winkommando’ (Winning Commando) as opposed to Potgieter’s ‘Vlugkommando’ (Fleeing Commando). After his defeat in the Battle of Boomplaats in 1848, Pretorius withdrew to Grootplaats at the confluence of the Crocodile and Magalies Rivers, where the Hartbeespoort Dam is today. Here he concerned himself only with Transvaal issues until his death in 1853. In a study of the life of Stephanus Schoeman for a doctoral thesis, published in book form as Stormvoël van die Noorde, OJO Ferreira dealt at length with the role Stephanus Schoeman played in the later part of the 19th century in Transvaal. The Transvaal civil war is also dealt with in detail by JEH Grobler in an unpublished master’s study on the life of Jan Viljoen, one of the leading figures in the civil war. Stephanus Schoeman, though largely his own man who had his own designs, was an adherent of Potgieter and, in fact, married the widow of Pieter Potgieter who succeeded his father as commandant general of Soutpansberg. Schoeman was appointed in this position after the younger Potgieter was killed in the Ndebele wars. On the face of it, the civil war was the result of the animosity between the Pretorius and Potgieter followers, but it was more complicated than that, as Potgieter and Pretorius were reconciled after the conclusion of the Sandrivier Convention in 1852. Stephanus Schoeman, however, wasn’t prepared to bury the hatchet and for the best part of the 1850s remained at loggerheads with the Volksraad and Marthinus Wessel Pretorius, who succeeded his father as commandant general. Schoeman came close to open rebellion against Pretorius a couple of times, but during Pretorius’s first tenure as president of the Zuid-Afrikaansche Republiek in 1857 they were reconciled when Schoeman was appointed commandant general. Schoeman seemed to have supported Pretorius in his ambition to unite the Transvaal and Free State Republics. His efforts, however, did not meet with general approval and Pretorius’s election as president of the Free State towards the end of 1859 led to further discontent. Pretorius was granted six months’ leave, on the assumption that he would bring about the unification of the two Boer republics during that period, but this was not to be. JH Grobler was appointed acting president, much to the disgust of Schoeman who was of the opinion that he (Schoeman himself) should have been acting president. Pretorius failed to persuade the Volksraad to acknowledge him as the president of both the Free State and the Zuid-Afrikaansche Republiek and had to resign as president of the latter. This did not meet with the approval of a section of the population. Especially the burghers of Potchefstroom were adamant that he should be reinstated in his position. They wanted Schoeman to be appointed acting state president while Pretorius was to be granted a year’s leave to negotiate unification. The Rustenburgers, under Paul Kruger, however, supported the Volksraad. At this stage the main antagonists in the Transvaal seemed to have been Stephanus Schoeman and Paul Kruger, commandant of Rustenburg, with M W Pretorius, now president of the Free State, trying to broker peace between them. Schoeman had fallen out with the new Volksraad which was elected in early 1862 and was suspended in April of that year. WCJ van Rensburg was appointed acting president. Schoeman refused to accept this and continued to act as if he were president. After prolonged and futile efforts of the Volksraad to get him to accept the situation, and to avoid arrest, he fled to Potchefstroom where he still had considerable support. Here he mustered the Volksleger to face the Staatsleger in which Paul Kruger played a leading role, though he was technically not in command at that stage. The Staatsleger was encamped near Witrand about five kilometres outside Potchefstroom and attacked the town on 7 October 1862. In the skirmish the 21 year old Hendrik Pretorius, on the Schoeman side, fell. On the side of the Staatsleger, PJ Botha of Donkerhoek was killed when a charge of gun powder exploded as he tried to load the cannon captured from Schoeman. Intense negotiations, even with MW Pretorius as facilitator, failed to secure peace and Schoeman withdrew across the Vaal to the Free State while Kruger occupied Potchefstroom. In February 1863 Schoeman was declared a fugitive and he was losing support in his traditional powerbase. Van Rensburg was elected with a slim majority as president of the Zuid-Afrikaansche Republiek. In the same election Paul Kruger was elected commandant general. In April an angry personality entered the scene in response to rumours that Van Rensburg’s election was rigged. He was Commandant Jan Viljoen of Marico who, with his commando, advanced on Potchefstroom where he met the Volksleger which assembled at Losberg. Here he was elected commandant general of the Volksleger. President Van Rensburg declared martial law on 5 December 1863. Kruger assembled his Staatsleger to advance on Potchefstroom to face Viljoen’s Volksleger which had since grown in number to over 500. Because of unrest among the native tribes in the Soutpansberg, which kept the burghers of that part of the republic occupied, the Staatsleger managed to muster only about 130 men, about 30 of whom Viljoen captured in the first confrontation. After another round of futile messages between the two armies and Kruger’s failure to muster more men, many burghers lost hope and deserted. On 13 December Kruger disbanded the Staatsleger in the face of the overwhelming superiority of the Volksleger. Kruger himself retreated to the Free State. He later denied that he had fled and said that he went there to wait for a favourable opportunity to resume the offensive. Whatever the case, the first round of this encounter went to Viljoen who now occupied Potchefstroom and captured all the ordnance left by Kruger. Meanwhile Schoeman, who was informed of the developments, returned to Potchefstroom hoping to take over the command from Viljoen. Viljoen, however, was in no mood to relinquish his position to Schoeman and waited in Potchefstroom for MW Pretorius, whom he wanted to confirm as president. When Pretorius didn’t turn up by 23 December, the Volksleger set out for Pretoria to hold a ‘national convention’. When Pretorius eventually arrived from the Free State, he was not at all pleased with Viljoen’s actions, which amounted to a coup d’ etat. Pretorius still wanted to be president, but he had no intention to attain the position by force. On 29 December 1863 Kruger received word from the acting commandant general of the Staatsleger, MJ Viljoen, that a commando of 300 men was waiting for him at Olifantsnek. When he reached Olifantsnek, however, the commando had already moved to Hartbeespoort where he found them encamped on the banks of the Crocodile River north of the Magaliesberg on 4 January 1864. The Volksleger had since advanced from Pretoria to Kommandonek to confront the Staatsleger and sent out scouts to find a suitable place near water to pitch camp. The sudden appearance of the Volksleger surprised Kruger and he entrenched most of his men behind the Swartkoppies near the present day Brits. On Tuesday 5 January one of his patrols ran into the vanguard of the Volksleger. Viljoen’s men immediately gave chase and Kruger’s men fell back towards the Swartkoppies where the rest of the Staatsleger was waiting. The first casualty was Commandant Johannes Enslin of the Staatsleger who was shot as he lowered his rifle after someone of the Volksleger shouted: “Don’t shoot! Let’s talk!” After that a deadly skirmish ensued in which another ten burghers were killed. 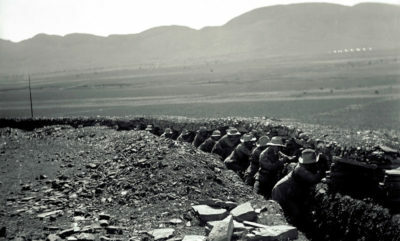 On the side of the Volksleger field cornet MW Pretorius (Swart Martiens), provisional field cornet Sybrand du Preez, Piet de la Rey, Willem Bester, Jan Marais and Philip Minnaar and his young son were killed. On the side of the Staatsleger the casualties were Commandant WJ Viljoen (not the commandant general), Commandant Johannes Enslin and Philippus Snyman. Fourteen burghers of the Volksleger and about eight of the Staatsleger were wounded. According to Ferreira, heavy rain interrupted the hostilities and provided both sides with the opportunity to calm down. Grobler says that the Volksleger retreated because Kruger’s men opened fire with artillery. Whatever the case might have been, the next day MW Pretorius turned up and after lengthy negotiations, which lasted until 14 January, a peace agreement was signed. Stephanus Schoeman and his son Hendrik, who acquired the farm Hartbeespoort some years later, did not take part in either the battle or the negotiations, as both reported sick the day before the battle. The negotiations were conducted under a karee tree along the road between Brits and Silkaatsnek. (The tree is still there.) Although the final agreement provided for a court hearing to adjudicate on the charges by the two parties against each other, the Transvaal Volksraad in the end accepted a recommendation by Pres Jan Brandt of the Free State that a general amnesty be granted to all belligerents. Neither Ferreira nor Grobler makes any mention of the oft-quoted episode where Kruger supposedly calmly took up position in front of his lines and lit his pipe with bullets from the Volksleger flying about him. None of the various versions of what transpired on that fateful day makes any provision for such a calculated display of contempt for the enemy, which action would have been foolhardy at best. All the burghers were skilled marksmen as evidenced by the fact that eleven burghers had fallen in the skirmish. Another provision of the peace agreement was that a new presidential election would be held. The election was won by MW Pretorius who was inaugurated as president on 10 May 1864 with Paul Kruger as commandant general. If either Schoeman or Viljoen hoped to be elected as commandant general, that hope came to nothing. Schoeman, now without any public office, started the Pretoria Rifle Corps, a position in which he continued to make a considerable contribution to the public life in Transvaal until his death in 1890. Historians are divided on the influence of the various issues that caused the turbulence in South African politics in the early second half of the 19th century, but there is little doubt that personalities played an important role. Stephanus Schoeman’s restless nature and his insatiable ambition must have been an important contributing factor, as did MW Pretorius’s ambitions to be president of a united Boer republic. A factor which most historians tend to downplay is the role of the churches, viz the Gereformeerde and the Hervormde Churches. Most members of the Volksleger belonged to the Hervormde Kerk of Ds Van der Hoff while most members of the Staatsleger, including Paul Kruger, belonged to the Gereformeerde Kerk of Ds Postma. But these were only some of the issues that complicated the situation in the early Boer republics. The major issue seemed to have been the personalities involved. It was a time that called for strong men to take the lead, which they did, but all too often their interpretation of what was best for the nation were not acceptable to the others. It was only after ‘broederbloed’ was shed in the squabbles that the leaders came to realise that their survival depended on cooperation and that their constant bickering was destroying their fledgling nation. Only then did they seem to accept the impact of the well-known Boer slogan: ‘Unity is Strength’ which enabled them to successfully reverse the British annexation of Transvaal almost 20 years later.